The front half of Oramene Lamarre’s house collapsed during the 2010 Haiti earthquake. She and her family of six lived in a tent camp for two years. 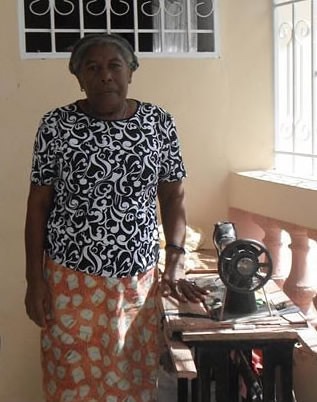 She was unable to run her old sewing business out of a tent, and the lack of income meant that there was no money to repair their home or move into a different home. In 2012, Oramene was approached by our engineers, who evaluated her damaged house to see if it was possible to retrofit it. Retrofitting is the process of bringing a damaged house up to earthquake-safe standards by addressing the damage and by making changes which strengthen the overall structure. Oramene sat down with our engineers and agreed on a retrofit design that met her family’s needs, including a front area where she could run her sewing business. She then received a $2,800 subsidy from Cordaid to conduct the retrofit work under the technical supervision of Build Change. Oramene’s adult son attended our construction training seminars and found good-quality construction materials to use. He also hired builders and helped supervise the workers. Today, Oramene’s house has been reinforced and meets standards for earthquake-resistance. She has been able to resume her sewing business, earning a living and providing for her family again. Her family is much safer than they were in the tent and in the unsound house. She likes her repaired home and believes it is prettier, as her sons painted it pink and orange, her favorite colors.